Serves: 6 people Difficulty ': Media Preparation time: 40 minutes INGREDIENTS 800g. 70g of hazelnuts. 260gr shelled pistachios. sugar 280 gr. 200g of honey. dark chocolate 2 egg whites 1 teaspoon of vanilla extract almond oil 3 tablespoons water PROCEEDINGS -------------------------- Shelled hazelnuts and allow to heat up a very hot oven (200 degrees) for 10 minutes, then rub between your hands to remove the skins. Put 30g. of sugar in a saucepan, cover with the same water and simmer for 5 minutes, then add the grated chocolate and stir until it will be 'completely dissolved. A part of you warm the honey up to a gentle boil. Meanwhile in a bowl surrounded by other more 'big plus' great flood of hot water, whisk the egg whites. In another saucepan gently caramelize the remaining sugar, moistened with 3 tablespoons of water. Mix egg whites, honey, caramel and vanilla in a single saucepan, add the hazelnuts and pistachios and continue stirring at low heat until 'all is not' well-connected. 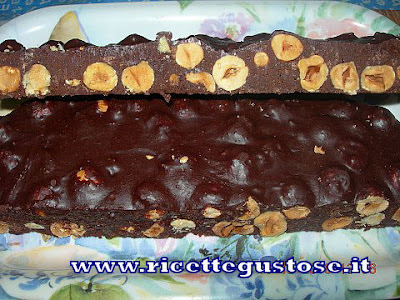 Pour the hot mixture on a rectangular plate, lightly greased with almond oil and livellatelo with a large spatula to a thickness of about 2cm. When the dough will be 'warm, cut into pieces and let cool completely. TIP If you want to keep the pieces of nougat, wrap them in aluminum foil, imitating the packaging of candy and put them in a big box airtight.